Prevents overload on natural teeth. Dental implants is the treatment of choice for people missing one, a few, or all of their teeth. Dental implants are anchored into the jaw to simulate the root of a pre-existing tooth. They are fixed replacements and therefore do not move. Implants can last a life time if taken cared of in the right way. Why choose Newnham dental care as your dental implant centre? Dr Milisha Chotai has a masters of science degree in Dental Implantology from the University of Bristol. Dentures replace missing teeth and in most cases also missing gum. The aim is to restore the look and function of your teeth and face. The dentures are manufactured together with a highly skilled technician. Our dentures are natural looking with optimal stability and function. Dentures are removable and may also be used as a temporary means to fixed replacement teeth such as dental implants. Dentures can also be further stabilized with implants in order to improve your confidence and your ability to chew foods. Dental bridges are supported by either natural teeth or by implants. A bridge is made up of crowns for the teeth on either side of the gap. 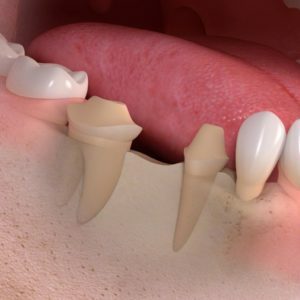 These crowns are called abutment teeth and will anchor a false tooth/teeth in between. Bridges can be made from gold, alloys, porcelain or a combination of these materials. A dental bridge is fitted on top of teeth surrounding the gap. It is a treatment option to fill the gap but involves grinding on the adjacent teeth. 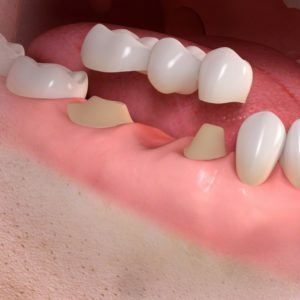 It is appropriate when the adjacent teeth are already heavily restored or when dentures or dental implants are not the best possible treatment option.